Fergusson went on to be a political adviser to Sir Geoffrey Howe, the Chancellor on whose watch, in the years 1979-83, inflation was beaten, though at great cost. After that, people stopped thinking about what it might be like to live in a society where money could not buy anything worth having – until the US confidence in its economic system was hit by the seismic shock of the banking crisis of 2008. 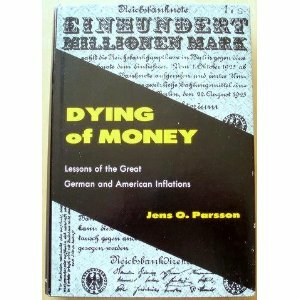 Then old copies of When Money Dies came down from the shelves, the dust was blown off them and people pored over its descriptions of everyday life in Weimar Germany. Warren Buffett, that great capitalist sage whose prowess as an investor has made him the world's second richest man, is said to have advised a Dutch financier to read the book as a cautionary tale about what could happen if governments run up such excessive debt. 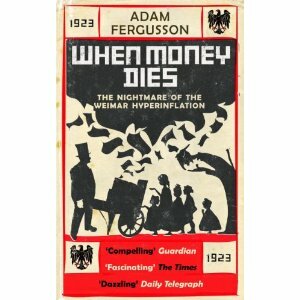 No one seems to know which Dutch financier was the recipient of this advice, or when, but the rumour helped push the potential sale price of secondhand copies of Fergusson above 1,139.6€ This month, a small publisher rushed out a new paperback version. I have not been able to pin down the new paperback version, reportedly selling for a Tenner. 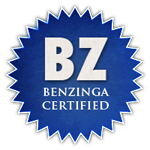 Any reader's hints in comments are highly welcome. Price swings for "Dying of Money" have been extreme in the last days. I have seen the book on ebay today at only €102 with 12 bidders so far and the auction running another day. Only yesterday it had an ask of 1,272.44€ at Amazon, which has crashed to 176.73€ at the time of writing.